This past week a vote was taken in the United States Senate and it was not a vote to end a filibuster! The vote that I am referring to was a vote to reauthorize the Violence Against Women Act. (VAWA) It was noteworthy that the vote actually took place at all, but the results of the vote were especially interesting. 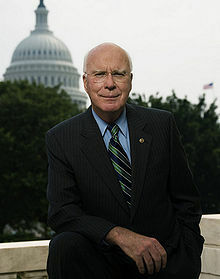 The vote to reauthorize VAWA, which was co-sponsored by Sen. Patrick Leahy, passed by a 78 to 22 margin. All 22 votes against the measure were by male Republican members of the Senate. Victims can call for help. The National Domestic Violence Hotline was established as part of VAWA. It currently serves over 22,000 victims a month and has taken a total of 3 million calls. Law enforcement officers are trained to help victims. 500,000 law enforcement officials, judges, and prosecutors a year are trained with VAWA funding to help domestic abuse victims. Partner violence and homicides fell. From the year before VAWA’s passage until 2008, the number of women being killed by partners dropped 43 percent, and partner violence against women fell 53 percent. Stalking became illegal. Before VAWA, stalking was not a federal crime. The law established stalking as a felony offense. I guess I could understand a Senator voting against the reauthorization if they thought the bill was too expensive and had not been successful in protecting women in the past, but that does not seem to be the case. Some of the reasons the dissenting Senators gave for voting against the VAWA are startling. One reason given was that the VAWA reauthorization included Native American women and LGBT women and undocumented women. Does it surprise you that all 22 of the dissenting Senators were male? If this act was so bad, you would think that at least one female Senator would have voted against it. Even in this current political climate, I just cannot understand how approving a bill that has helped prevent violence against women could be voted against by anyone. Eight of the Senators even voted against moving the bill ahead to a vote. From a political standpoint, I was surprised to see so many Republican Senators vote against reauthorizing VAWA. Especially in light of the Republican Party’s public attempts to court Hispanic voters, it seems strange that some of the leading Republicans in the Senate would vote against a bill designed to continue programs that have helped protect women at risk. I think we should ask Senate Minority leader McConnell and GOP Presidential hopeful Marco Rubio and Sen. John Cornyn and Sen. Lindsey Graham and Sen. Chuck Grassley, and the other dissenting Senators, if they think women do not deserve the legal protections afforded them in this important piece of legislation. Would women in these dissenting Senator’s states agree with their votes on this legislation? Do these gentlemen remember how many voters are women? What do you think of this legislation? That is pretty good advice for a free society of individuals engaged in voluntary cooperation. But it doesnt require religion or God. Granted it came from a rabbi but it is good advice for everyone. I could rationally come to a conclusion that I must kill you but that doesnt make it right, I am pretty sure Ayn Rand didnt condone that type of thinking. Government is necessary and nowhere does Rand say it isnt, she is not an anarchist. The problem with recognized societal limits is that sometimes those limits are troubling to say the least. Think about it, we voted for slavery which was an abomination against man, yet it was perfectly acceptable. Well within societal limits at the time. Look at the Nazis, nasty brutish thugs yet Hitler came to power by way of popular vote. German society during those years was crazy. We need more than just societal limits to inform our interactions, we need an objective moral standard informed by the value of an individual human life. You cannot base ethics or morality on anything else. In a free society I am not sure why this is a problem? If you want to join a commune and engage in free love and one for all and all for one, be my guest just dont ask me to contribute or to join. I should have said there is no need for a compromise in a free society because you can do your thing and I can do mine. Of course so long as either of our things dont violate others rights. Without defined rights, without agreed upon morals, without agreed upon norms….there can be no middle, because there is no definition of what is extreme in order to determine what is accepted. You can study the norms of a society by examining the fringe elements of that society. So, as I’ve said before, the problem is not meeting in the middle, its the impossibility of doing so in an Ayn Rand free society. Finding a way to have people agree on what is a right or what is a norm, when there is no formal or agreed upon way of achieving those definitions, is problematic, which is why it doesn’t work in a Rand style free society. For example, you say at the end of your post, “of course so long as either of our things don’t violate others rights.” Well, in an Ayn Rand free society, void of governmental rights and religious morals, how are you defining these rights? How do you determine what is the middle? This is the problem. Not that meeting in the middle is bad…just that it is not possible when it is entirely dependent on an individual’s decision to respect or disrespect your supposed right based upon what that individual subjectively considers to be rational and moral. Basically, if I don’t agree with what you consider to be your rights, in Ayn Rand’s view, I’m just fine, as long as I came to that conclusion rationally. That is the problem. It’s not the middle…its the fact there can be no middle without a definition for what should be center or on the extremes. I really suggest you read some American Studies and Humanities journals, as well as the Tragedy of the Commons, they have fascinating essays about how we learn and experience culture and the Commons highlights the problems of relying on an individual’s subjective view…it takes only one greedy jerk to ruin the commons for everyone. I’m not sure why Ayn Rand suddenly became so popular, especially when her writings had largely been cast aside for ages, but you don’t strike me as a true follower….which is good. I’m sure she appeals to your desire for free commerce (where her ideas work the best, because there is structure already in place…although governments and business put those structures in place) and individual free choice, but you also recognize societal limits and the rule of governmental law…two things that are inherently not Ayn Rand.